Benjamin asked Tom Morris, the artistic director of the festival, to pick a film for him to accompany that had a lot of atmosphere, drama and potent emotion. Typically, Benjamin doesn’t view the film in advance of the public screening, preferring to plunge in sight unseen, preferably with the aid of a big screen and an outsize piano. Benjamin accompanies silent films for fun. 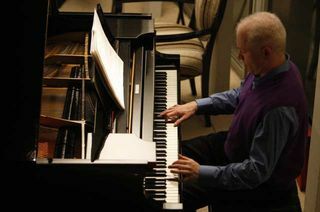 Although he estimates having played during the screenings of some 30 or 40 films during his career as a pianist, he doesn’t ascribe much artistic value to the activity. However, on one occasion, while providing the accompaniment for the 1929 Georg Pabst film "Pandora’s Box" in Lyon, France, in 2000, he improvised an approach to accompanying the film’s climax that has informed his thinking about the new, as-yet-unnamed, full-length opera that he is currently working on with the librettist Martin Crimp. He had previously accompanied the final scene, in which Jack the Ripper kills Lulu, with suitably melodramatic, stürm und drang-infused music. But in Lyon, he decided for the first time to move in the opposite direction.